Jimmy Njiminjuma, who passed away in 2004, was a senior artist painting for Maningrida Arts and Culture. 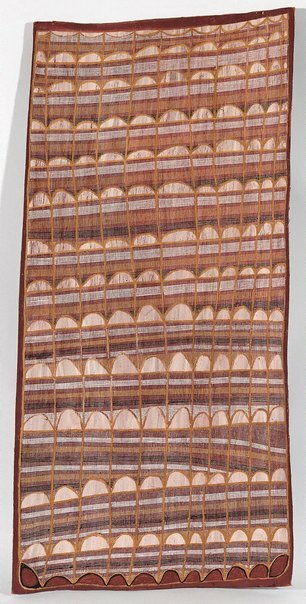 Njiminjuma's brother is John Mawurndjul who is widely regarded as the most significant bark painter in Arnhem Land today. Njiminjuma's subject matter essentially centres on the depiction of Ngalyod the Rainbow Serpent, Yawkyawk figures, Namorrkon, the Lightning Man and Wakwak (Crow Dreaming). 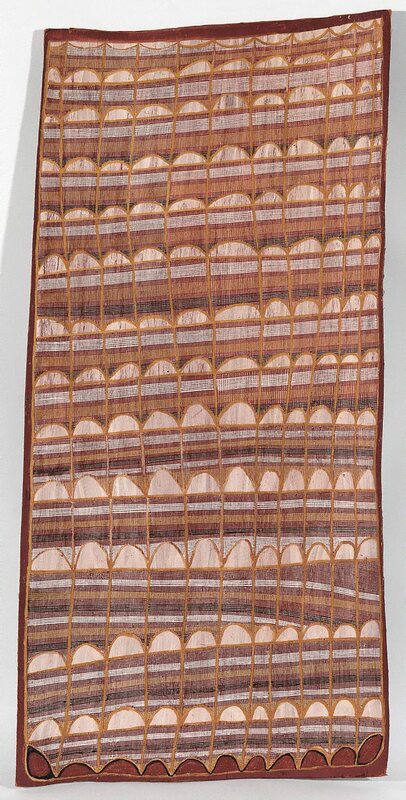 Both Njiminjuma and Mawurndjul are closely related to the artist Peter Maralwanga who was taught by the artist Yirawala. In the painting 'Wakwak (Crow Dreaming Site)' 2000, Njiminjuma has depicted a sacred site at Kurrurldul, his outstation south of Maningrida. The rarrk or abstract cross-hatching on this work represents the design for the crow totem ancestor called Djimarr. Today this being exists in the form of a rock which is permanently submerged at the bottom of Kurrurldul Creek. The djimarr rock in this stream at Kurrurldul is said to move around and call out in a soft hooting sound at night. Both the stone itself and the area around it are considered sacred. The pattern used here is the crow design for the sacred Mardayin ceremony which is a large regional patrimoiety ceremony now rarely conducted in central and eastern Arnhem Land.